“The region bounded by the Imperial Palace on the W.; the Sumida River on the E.; Shimbashi Station at the S,; and Manseibashi on the N is the busiest, the most densely populated, the wealthiest, and the most progressive of the metropolis. 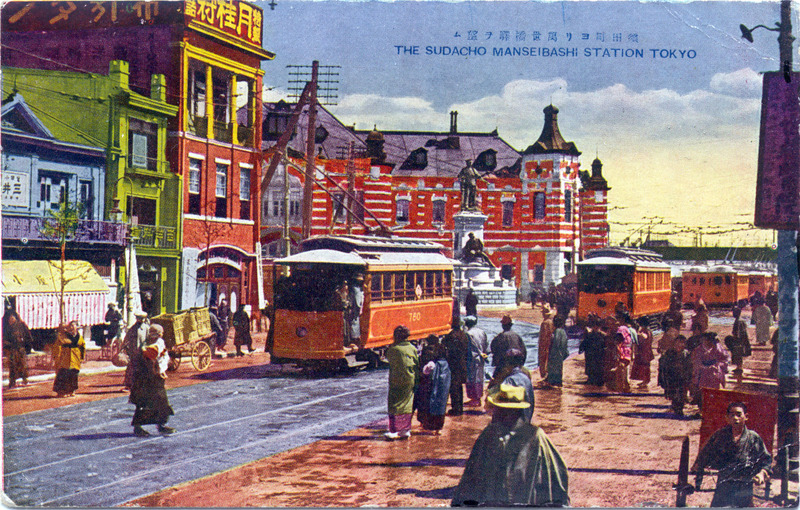 “The new Manseibashi terminus of the Central Rly [Chuuo-sen], which comes to this point through Kanda and other wards, [is] in the Renaissance style, contains 2 million bricks, 20,000 granite blocks, 180 tons of steel, and considerable marble and bronze, and was completed after designs by Prof. Tatsuno in 1912 at a cost of ¥300,000. “The Bronze Monument facing it is one of the finest in Tokyo and was unveiled in May 1910. (The bronze statues are after the design of Prof. Takamura Koun, of the Academy of Fine Arts.) The life size figure surmounting the shaft is that of the brave Commander Hirose who nobly sacrificed his life in a vain effort to rescue a non-commisioned officer during the memorable marine night on Port Arthur during the Russian War. Manseibashi Station was the eastern terminus of the Chuo-sen [middle railway line], In 1889, plans for a railway west from Tokyo were realized along a route roughly following the feudal Nakasendo [central mountain road] post road to Kyoto via Matsumoto. 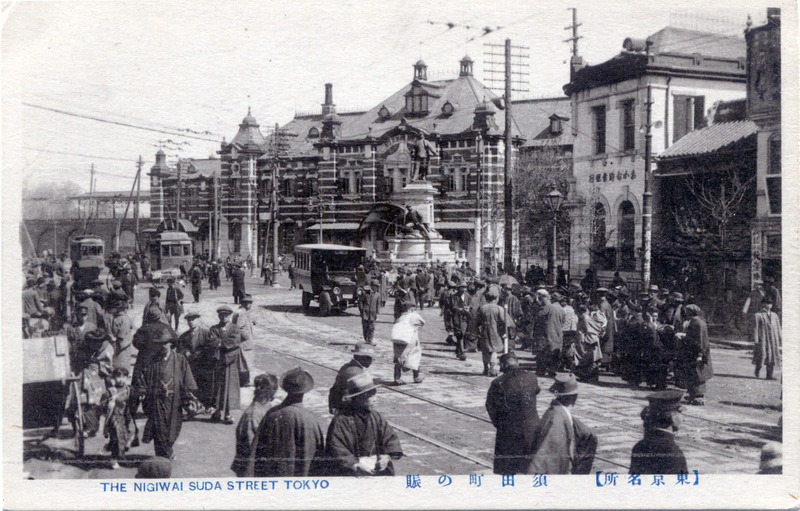 With the formation of the privately-owned Kobu-Tetsudo-sen, the first section of track was laid between Shinjuku and Tachikawa. 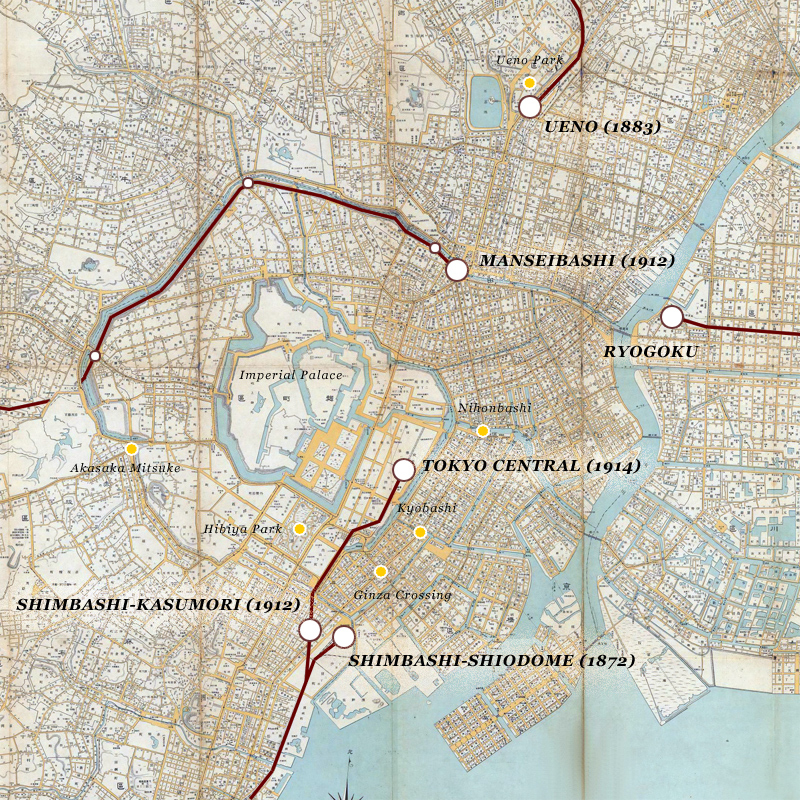 In 1895, service was extended within Tokyo to Iidamachi. Service to Ochanomizu was completed in 1904. After long-distance railways were nationalized in 1906, the Kobu-Testsudo was renamed the Chuo-sen by the government built and a new terminal east of Ochanomizu at Manseibashi [ten-thousand generation bridge] opened April 1, 1912. 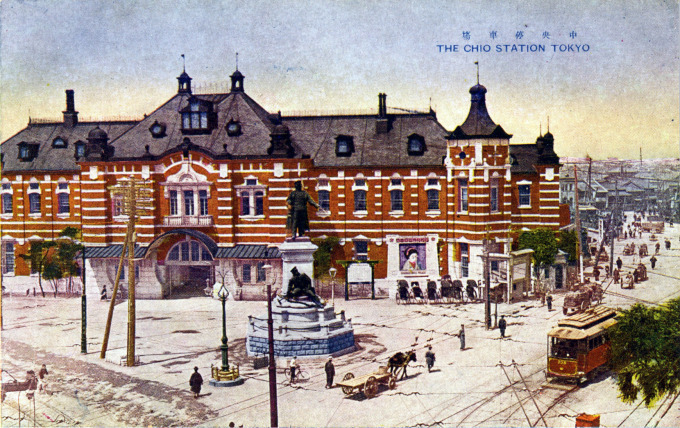 The station terminal was designed by Tatsuno Kingo in the grand European rail tradition, and was similar in appearance (but larger) to the Shimbashi terminal at Kasumori. Tatsuno would also oversee the design and construction of the even-grander Tokyo Central Station. Manseibashi would remain the eastern terminal of the Chuo Line for seven years, until through-service was completed onward to Tokyo Central Station. 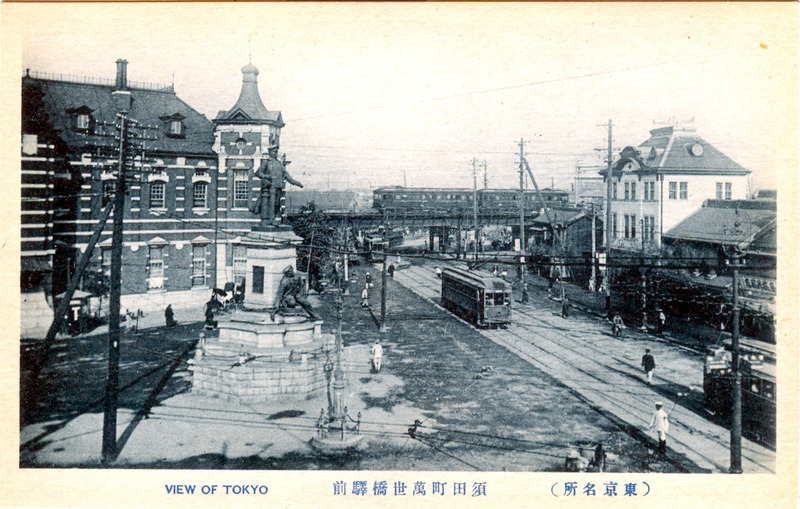 Elevated view of Manseibashi Terminal and station plaza, c. 1920. 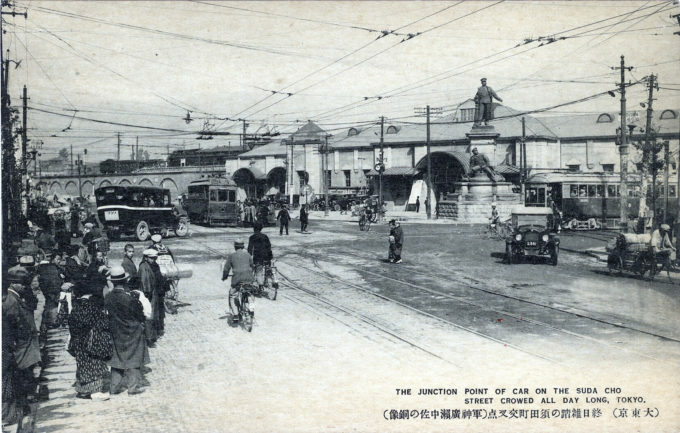 Street view of Manseibashi Station, c. 1920. Streetcar crossing the Manseibashi Bridge in front of the terminal, c. 1920. 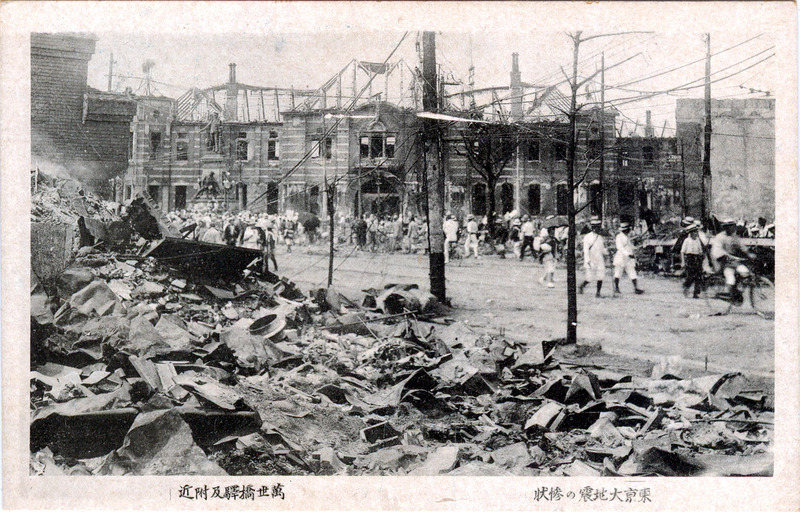 Aftermath of the 1923 Great Kanto earthquake. 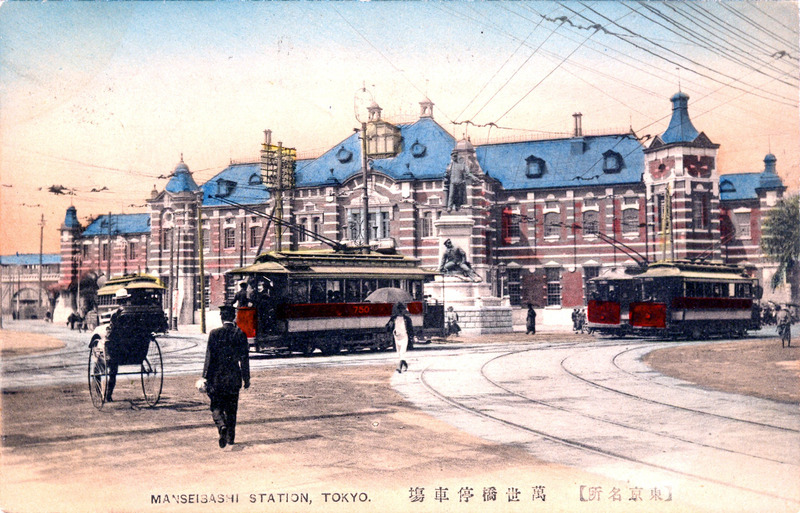 Manseibashi Station, as with Shimbashi Station, was eventually rendered redundant with the opening of the new central terminal at Tokyo Central and completion of through-service there in the early 1920. And, as with Shimbashi Station, Manseibashi station was not rebuilt to its former and impressive red brick splendor after being leveled by the 1923 Great Kanto earthquake. Only the station platform was left standing after the earthquake. 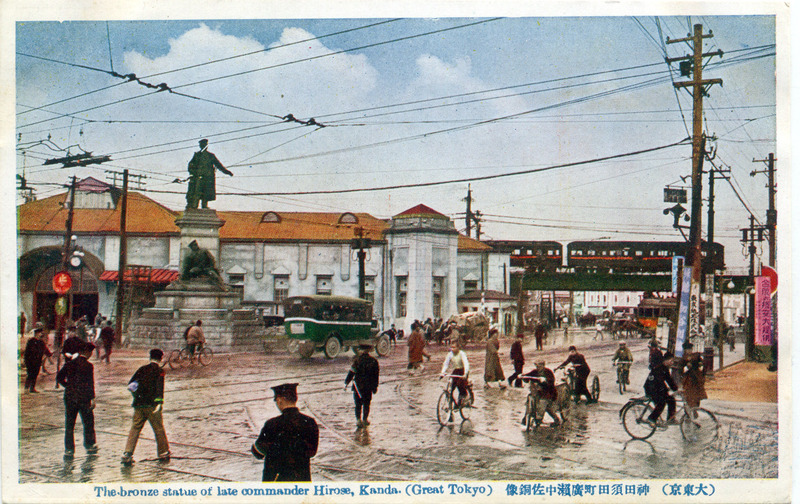 In 1936, the station was closed and the building was repurposed into the Tokyo Transportation Museum (1936-2006). 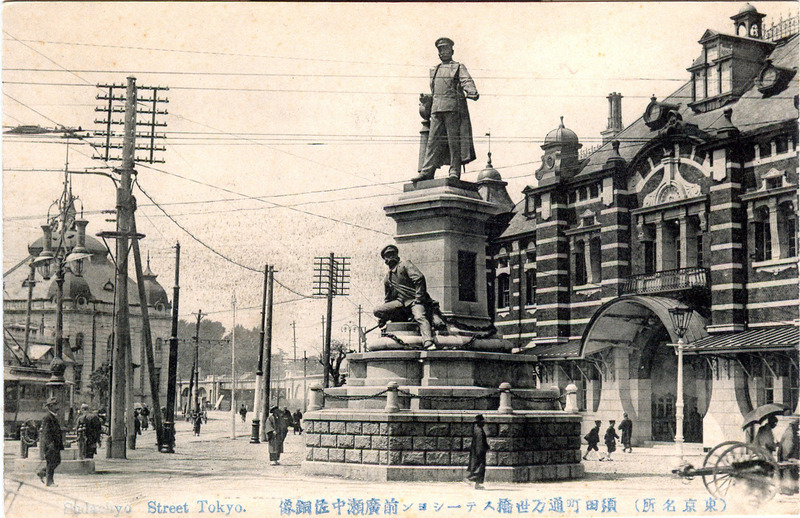 The statue of war hero Commander Hirose Takeo outside Manseibashi Station, c. 1915. On the station plaza, fronting the Kanda Sudacho district, was a statue of Russo-Japanese War naval hero Commander Hirose Takeo. The statue remembers his sacrifice during the Battle of Port Lushun in 1905 when Hirose’s warrant officer was setting charges to scuttle a ship and seal off the harbor to entrap Imperial Russian navy. A Russian torpedo struck the ship. Hirose surged from his launch, grasping his sword and, with complete disregard for his own safety, made a vain and fatal attempt to rescue from the burning vessel his subordinate. Hirose was deified in statue and song as Japan’s first modern Gun-shin [war god] and became a model henceforth for the all Imperial Navy officers and sailors of noble self-sacrifice.